Late summer is often the best time to be out in the garden or on the patio with the onset of mostly milder temperatures and long, dry days. The busiest parts of the growing season have passed. It is time to relax and enjoy what you have created. Hardy Fuchsias differ from your typical hanging basket displays in that they can be planted directly in the ground or in a container and have no trouble surviving our typical winters. The hardiest derive from Fuchsia magellanica, native to Chile and Argentina although there are many species from New Zealand and Tahiti as well. Hardy to temperatures as low as 0 degrees F, their flower power is unmatched. Add to that their superior attractiveness to hummingbirds and bees and you have a true garden performer. Hardy Fuchsias like a rich soil with plenty of nutrients and water. They require a deep root system in order to give their best performance, so if planting in containers be sure to choose larger sizes. While Fuchsias are mostly planted in shade or partial shade, they do very well in considerable sun as long as they are not against a south or west wall with intense reflected heat. Swansons is well known for our substantial hardy Fuchsia selection, which features many hard-to-find and unique varieties. Our buyers take great care in selecting local growers who are willing to grow specific varieties and sizes for us so that we can offer the best selection to our customers. With over 20 varieties in stock during the selling season, there is an opportunity to pick anything from small, flowering dwarf types to five-foot tall shrub varieties that virtually can become small trees over time. Fuchsia flowers can be single or double and almost always have two-part flowers in combinations of red/purple, white/pink, pink/pink, pink/purple, white/cerise, and even white/orange. Small, edible fruits that are rich in vitamin C are produced on most varieties, great for making chutneys and jams. One of the more intriguing smaller types is Fuchsia procumbens or Creeping Fuchsia. A dainty, bright green, rounded leaf carries exquisite multi-colored blooms reminiscent of a Passionflower. Growing less than 3 inches tall and 3 feet wide, it is a delightful container plant or small-scale groundcover under taller perennials or low shrubs in part to full shade. Another useful dwarf is Fuchsia microphylla ‘Variegated Lottie Hobby’. An arching plant with light white-edged variegated leaves, it is perfect at the base of an upright shrub or spraying over the edge of a pot. It grows up to 2 feet high and 18 inches wide with tiny red flowers all summer and does best with protection from the afternoon sun. There are also numerous smaller-growing varieties ranging from 1.5 to 4 feet high and wide. ‘Beacon’ is a rich red/purple single, while ‘Dying Embers’ grows to only 1.5 feet carrying a profusion of rich red/purple-black single flowers. Outside of the normal red/purple color range, you will find ‘California’ with its orange/pinky-orange elongated flowers growing to 3 feet high as well as ‘Celia Smedley’, a beautiful, large Fuchsia with light pink/salmon-orange single flowers that grows to 3 feet high by 2 feet wide. For more information about hardy Fuchsias, see the Northwest Fuchsia Society, which has tested innumerable varieties for their vigor and winter hardiness. Their website has an extensive list of varieties particularly suited to the PNW. Whichever variety you choose, you are sure to enjoy spectacular blooms all summer and into fall. 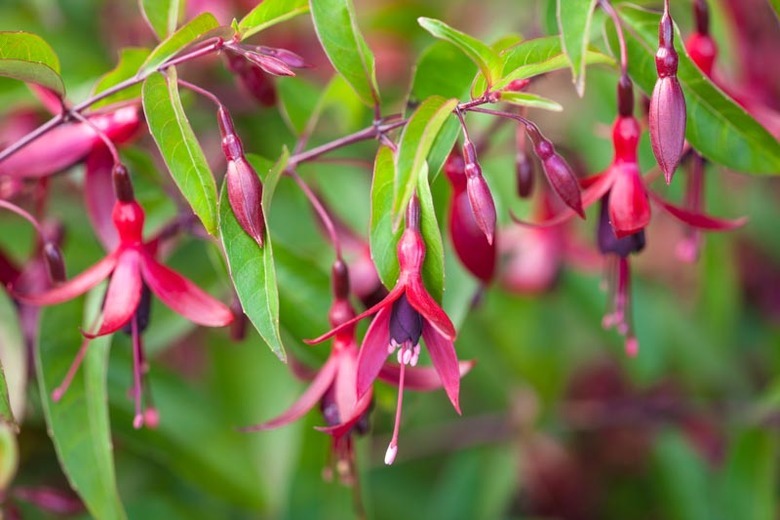 If you need advice on choosing the perfect Fuchsia for your garden, we'd be happy to help. Ask us in person or reach out on social media using hashtag #heyswansons. Learn more about planting Hardy Fuchsias.